Oh! 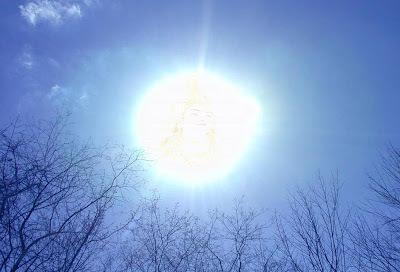 Lord Surya, ruler of the universe, you are the remover of all diseases, the repository of peace I bow to you. May you bless your devotees with longevity, health and wealth. People keep fast on Sundays in the name of Surya Narain or the Sun God. They take food only once a day, generally fruit, before sun-set. Saltish and fried items are avoided. It is believed that a fast on a Sunday saves one from skin diseases like leprosy, ringworm, and eye sores. Sun God is worshipped with red sandalwood and red flowers. The Markandeya Purana describes the birth of Sun God. The beautiful Aditi was born as daughter of Daksha. 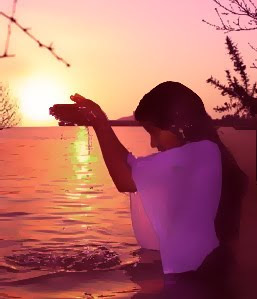 Kasyapa beget on her the divine Sun. He is identical with Trinity. Surya was married to ‘Saugna Devi’, the daughter of ‘Viswakarma', the divine architect. She bore Surya three “children -‘Vaivaswata Manu, Yama and Yamuna’. It came to pass that she could no longer bear the brilliance of her husband’s presence. She fled leaving behind ‘Chaya’, her shadow for years, Surya did not notice this change. ‘Chaya’ bore him three children ‘Savarni Manu Sani and Tapati’. One day in a fit of anger, ‘Chaya’ cursed ‘Yama’, the son of ‘Saugna’. The curse took effect and Surya was stunned. He knew that no mother’s curse could ever effect her offspring. He questioned ‘Chaya’ who blurted out the truth. He searched for his beloved every-where. At last he spotted her frolicking in the forest in the form of a mare. In order to win her back he changes himself into a horse a horse approached her gently and befriended her. In this form she bore Surya twins called ‘Aswini-Kumaras’. Who later became celestial physician and surgeons. Surya and Saugna turned back into their original forms. In order to keep her by his side, Surya allowed his father-in-law to put him lathe and to share away an eighth of his brightness. Thereafter, the couple lived together in great bliss. The brightness shorn out of the Sun God was put to good use. Out of it were produced ‘Sudarsana Chakra’ for Lord Vishnu, Trisul for Siva, the lance to Kartikeya’, ‘Vajrayudha’ for Devendra, sword and arrows for Goddess Durga and so on. There is another story in ‘Sarva Puranasara’, Once the Lord of Heaven visited Siva-Parvati on Mahasivarathri day. After darshan he revealed to Siva that he desired to install a replica of Eswara at a holy place where Siva ordered-Shiva told him that instead of the said proposal, it would be more appropriate to install Surya at Arasavalli, because He represents Trinity. Further Shiva accorded a boon that he would be attends there as Kshetra Palaka. Indra was so pleased with folded hands. Then and there he ordered Viswakarma to construct a huge and beautiful temple for Surya. This story of the Sun God, is related on the occasion of Sunday fast. It depicts the importance of cow and cow dung and suggests the victory of innocence over jealousy. Once there was an old lady. She would get up early in the morning and took her bath. She kept her house dean by plastering it with cow dung, and took her meals only after offering food to the Sun God. She lived a happy life. This lady used to collect cow dung from her neighbours house. The neighbours wife was jealous of her. She tethered her cow inside the room so that the old lady could not collect the dung. 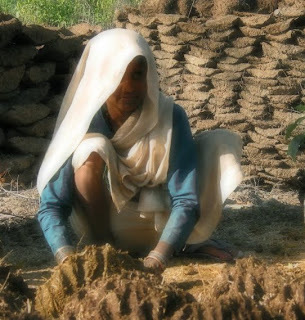 And as she could not plaster her house with cow-dung, she did not cook her food. She did not even offer food to the idols. She remained on fast throughout the day and slept with empty stomach. The Sun God appeared before her in her dream. He sold, Why did not you take your meals? Why did you not offer food to the Idols? The old lady said politely, My neighbours lady did not allow me to collect cow-dung from her house. I could not clean my house. I have no cow of my own. The Sun God said, I am happy with you because you kept fast on Sunday. I am pleased with your worship. I shall give you a beautiful The god disappeared. The old lady opened her eyes. A beautiful much cow with a calf was there in her courtyard. She was surprised to see them. She arranged hay and water for them. When the neighbours lady saw the cow in the old ladys house, she became jealous of her. She also noticed that the cows dung was of gold and not an ordinary dung. She took the gold dung and replaced it with the ordinary dung of her cow. She continued the replacing practice for a number of days. The Sun God noted that the old lady was being cheated by her neighbour. He caused a storm at sun-set. The old lady tethered her cow inside her room for its safety. She was, however, surprised to see that her cow gave her gold dung instead of an ordinary one. She could see through her neighbours trick. The neighbours lady was constantly jealous. She thought of a plan to deprive her of the wonder cow. She went to the king and said, My Lord, a poor old lady in our neighbourhood has a divine cow. The cow gives gold dung. It would be befitting for your graciousness if this cow Is with you. She keeps it inside her room. No one can have even its glimpse. The king was a greedy person. He told his courtier, Go immediately and bring the cow. The king woke up. He was badly shaken. He saw that the entire palace was full of cow dung. There was bad smell all around. In the morning, the king sent for the old lady with due honour. He returned the cow to the old lady and also gave her some wealth. The neighbours lady was suitably punished which was a cause of relief to all. The king proclaimed order that all his subjects should observe fast on Sundays if they wanted their desires to be fulfilled. Now, all his people were prosperous. Illness never visited them. They never faced any natural calamity. Everyone enjoyed happiness. ::- On the day of Vrat, Wake up before Sun rise. ::- Take a shower and wear a New and Neat cloth. ::- Take your meal and Fruit, only while Sun is in the sky. ::- If you have taken Fast, and if Sun does not come in the sky, do not take any Meal or Fruit and take that next day when Sun comes up in the sky. ::- Do not take Salt and Oily food in your meal. ::- You can get Respect and Honour in the Family and Society. ::- You can get victory from your Enemies and Rivals. ::- If you have Eye problem, you can get cure. how can you eat your meal if you are taking a fast. my understanding was that you could only take meal after the sunset. can you please give me details about the vrat. As for most of the vrat you have to fast and eat only after the vrat is over at the end of the day. what colour of bottle is used for eye diseases and how many days it should be kept in sun?